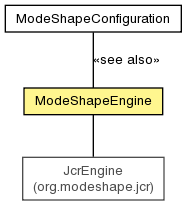 A single instance of the ModeShape services, which is obtained after setting up the configuration. The component responsible for reading the configuration repository and (eventually) for propagating changes in the configuration repository into the services. The default interval (in seconds) for running the garbage collection sweeps, if there are sources require it. Blocks until the shutdown has completed, or the timeout occurs, or the current thread is interrupted, whichever happens first. Check the configuration given by the supplied graph. Check whether there are any problems that would prevent startup. Get a subgraph containing the configuration content. Get the context in which this engine is executing. Get a graph to the underlying source, using the supplied context. Get a graph to the underlying source. Return the component that is able to detect MIME types given the name of a stream and a stream. Get the problems that were encountered when setting up this engine from the configuration. Get the RepositorySource instance used by this engine. Return the component that is able to extract text given content and its MIME type. Shutdown this engine to close all connections, terminate any ongoing background operations (such as sequencing), and reclaim any resources that were acquired by this engine. Start this engine to make it available for use. The default interval (in seconds) for running the garbage collection sweeps, if there are sources require it. The default value is 600 seconds, or 10 minutes. Get a graph to the underlying source, using the supplied context. Note that the supplied context should be a derivative of the engine's context. Check whether there are any problems that would prevent startup. Any warnings or errors will be logged, and this method will throw a ModeShapeConfigurationException if there is at least one error. Construct a new ModeShapeConfigurationException. This method can be overridden by subclasses when a subclass of ModeShapeConfigurationException is to be thrown from start(). IllegalStateException - if this method is called when already shut down. Shutdown this engine to close all connections, terminate any ongoing background operations (such as sequencing), and reclaim any resources that were acquired by this engine. This method may be called multiple times, but only the first time has an effect.